This milestone started with a wiggle. And it wiggled and wiggled and wiggled, before Grace lost her very first tooth on June 1. When I dropped Grace off for preschool one morning this spring, I noticed one of her big teeth was coming in behind a baby tooth. Her baby tooth was only a little wiggly at that time, and since Grace has a mostly liquid diet, she doesn't use her teeth much, and it took a long time to actually fall out. 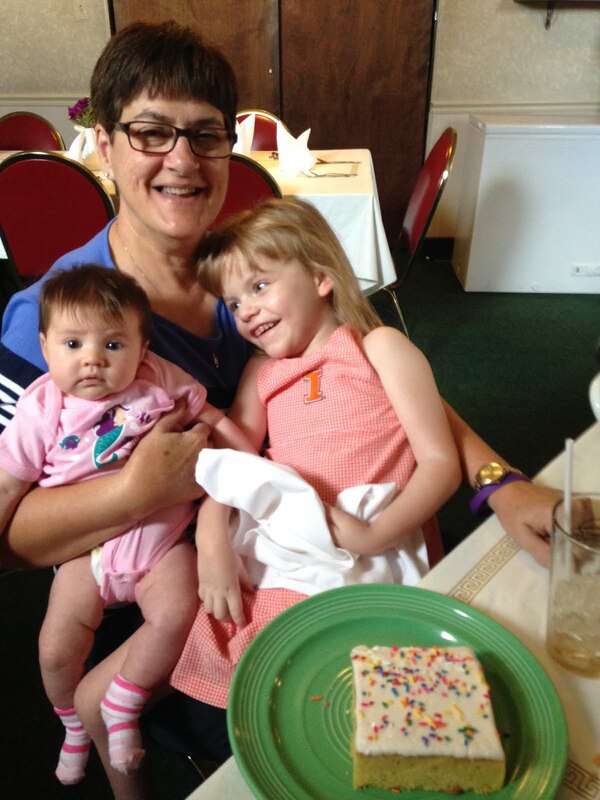 The girls and I were having lunch with mom at the Ariston when I noticed her baby tooth had finally fallen out. So, we celebrated with a piece of dessert and lots of excitement. Even though she had actually swallowed her tooth, we still put her special little tooth box next to her bed for the tooth fairy to come, leaving some money for her piggy bank under her pillow. After losing her first tooth, I got out Grace's baby book to fill in the spot for her first lost tooth. It was fun to look through all the pages and photos, filled with other firsts and milestones for her first couple years of life. It's funny how hard it is to remember back even just a few years, and I'm awfully glad to have written down some special memories. Much to my delight, her first word was "mama," and although Grace only ever had a handful of words, it's so sweet to remember the ones she did. Some of my favorites were ball, pup, Elmo and even amen. One evening, Grace and I were waiting in the living room for Kyle's dad to come and watch her. We were standing by the front window, and as he came up the walk, Grace very softly said "papa." I was so proud of her, and something I will always remember. 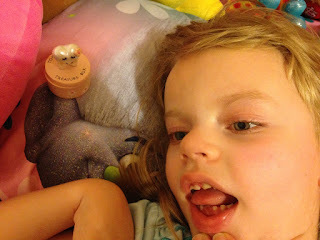 We put her tooth fairy box out, even though she swallowed her first loose tooth. Although I'm not always very clever, when Grace's first tooth popped through, I noted in her baby book that it finally came through after we'd had dinner at Greasies, and she was wanting to try a cheese smack. I also made note that one of her favorite sounds was the garage door because it meant that mommy and daddy were home. And I'm sure glad I took the time to write down so many of her firsts from along our journey. Grace wasn't much of a crawler until she was bigger. In fact, for the entire first year of her life, you could leave her in the room and come back to find her in the exact same place. She'd be mad you left her, but she was content to be right there. 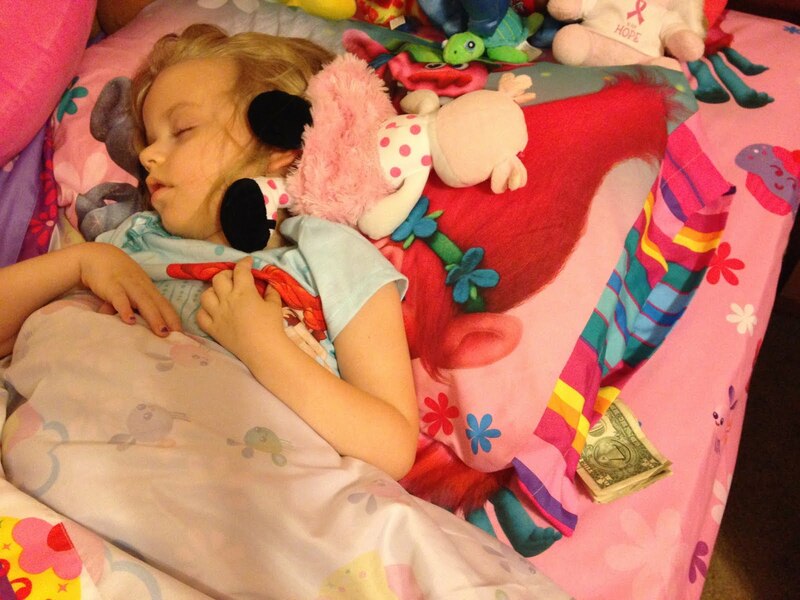 Grace slept right through the Tooth Fairy's visit, but she left some money for Grace's piggy bank. As we started working with her on walking, she was really only ever able to walk between us or between pieces of furniture on her own. One of my favorite photos is one Kyle took of Grace holding my hand while we walked across the backyard to my mom's house one afternoon. And I can remember two very distinct times that Grace took off walking on her own. She never made it very far, but it's something I hope to always remember. The first time was at Kyle's mom and dad's house. Grace took off from a kitchen chair into their living room, but in trying to get Kyle's attention to watch her, I startled her and she fell. The other time was at church one morning. Grace left our pew and took a few steps across the aisle to where Nancy Harrell was sitting. I'm not sure who was more delighted, but Grace sure was proud. I will probably not have any memories of Grace running across the backyard to give me a hug, bounding down the steps of our house or even chasing her little sister in the backyard. But that's okay. We do our best to cherish each and every moment we do have with Grace. And I think it helps us to celebrate the little milestones even more. I'm hoping to start writing in Charlotte's baby book this summer, but we've already seen so many firsts with her. She rolled over for the first time in April when Grace was having physical therapy in Springfield. We think she wanted to show off too. She also loves to smile and has started "talking" all the time. We truly love every single minute and can't wait to see more firsts in the next few months. It seems strange to say, but one of the greatest gifts INAD has given us is finding the joy in all the little moments and milestones. For us, it's not about winning the baseball game, getting the lead in the school play or even dreams of becoming president someday. On this Grace-Filled Journey, we celebrate smiles and strive to find happiness in all that we do. So, even though we can't wait to hear Charlotte's stories or run across the backyard someday, we'll still be finding happiness in all the little moments life has to offer.